Sweet potatoes seem to be taking over my apartment lately thanks to the abundance of them that appear in my CSA each week. So, when I finally had a night in and a chance to get creative with my dinner, I turned to the ol’ orange potato. I stared at the bowl of them on my kitchen table and pondered what I could do with them aside from roasting, baking, or mashing. Then, a stroke of laziness came over me and I thought seriously about just making some pasta. But through this laziness came a stroke of inspiration. I decided to make these potatoes into pasta. So I got out my julienne peeler and while I was creating elegant little strands of potato, I thought about what I was going to top it off with. I settled on a goat cheese sauce (because I am a goat cheese fiend), which I mixed with some Greek yogurt and I topped the whole thing off with chives. Cooking the potatoes with a little bit of cinnamon brought this dish together perfectly. When it was done, I sat on my couch, poured myself a glass of wine – one of my new favorite finds, I might add – and caught up on some Breaking Bad. It was a perfect Tuesday evening. 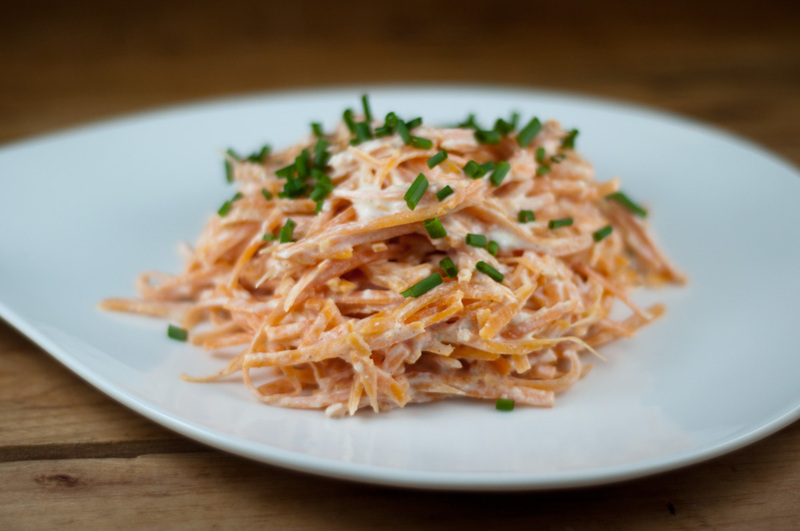 Use a julienne peeler to peel sweet potato into long spaghetti-like strings. If you don’t have a julienne peeler, use a regular vegetable peeler to form ribbon shaped strands more similar to fettuccine. Heat olive oil and salt in a pan over medium-high heat and add the potato strands and sauté for a few minutes. Add cinnamon and sauté for another minute or two. Add water and let cook for another 5 minutes or so or until potato strands start to soften, then strain and run some cold water over the potatoes to stop the cooking process. Return pan to the stove and add goat cheese and yogurt, mixing together over medium heat until cheese is fully melted. Mix desired amount of sauce into the potato spaghetti, plate, top with chives and fresh cracked pepper. This entry was posted in Recipes and tagged Chives, Cinnamon, goat cheese, Greek Yogurt, sweet potatoes. looks awesome! cant wait to try it. I was really impressed with this dish. A half cup of each of goat cheese and greek yogurt was way too much for one sweet potato. A little less than 1/4 cup each works perfectly. I also couldn’t see the reason for adding the cinnamon then rinsing it off in the cold water. So I added a pinch to the goat cheese/yogurt mixture. I think I can bypass pasta alfredo with this dish. Wonderful!! Thanks! Odd, I was brought here by a Vegan food website. =/ I guess I will have to modify it. Where did you come across Sprout & Pea? Loving this recipe! Wouldn’t have ever thought of using sweet potato as spaghetti. Love those ideas! Sounds delicious.